One of the tools in your Magicality Toolbox is Meditation. Meditation is one of my favorite things to do because it gives me the opportunity to slow down, relax and get in tune with my subconscious thoughts for 15-20 minutes a day, if not more. When you have this opportunity, it really helps improve your overall mood and allows you to truly get in tune with what you truly desire in life. Sometimes we can’t attract things into our lives because we don’t know what exactly it is that we truly want. Meditation can help you discover this. And for only 15-20 minutes a day as the investment time, you will be glad that you dedicated yourself to this. 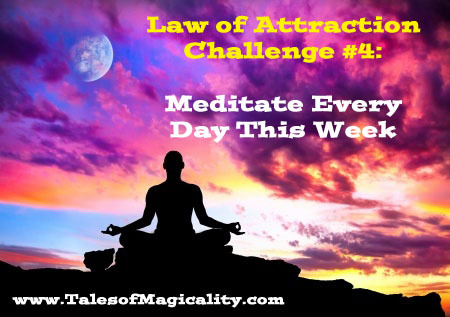 So this week’s challenge for you is to put aside 15-20 minutes and Meditate Every Day This Week. There are sooooo many methods out there for meditation. This is your time, so choose whatever meditation you prefer the best. Also, don’t worry about what position you are while meditating. You want to be comfortable, so if it be sitting straight up, legs crossed or laying down–whatever position allows you to enjoy your meditation is the best. You can go to Pandora and choose a meditation station to listen to background music as you meditate or you can decide to meditate in complete quietness. You can also even do guided meditations. For your help, I have included a Guided Meditation from one of my favorite Law of Attraction guru’s, Bob Proctor. Whatever method you choose, remember it is something you should enjoy doing. Watch how each day feels better and better because of your meditations.